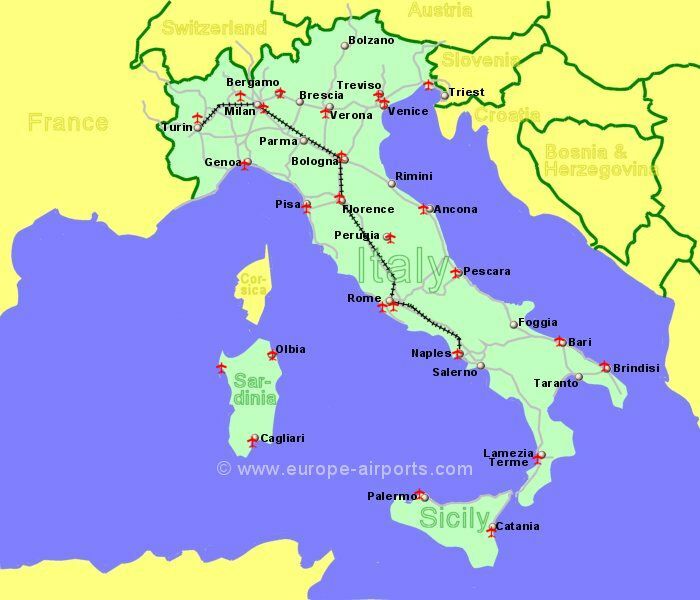 Italy plus the islands of Sicily and Sardiniahave beach resorts and a wealth of historical building and art, paticularly in Rome, Florence, Verona, Pisa and Venice to name a few. Away from the Alps, of course, Italy enjoys the Mediterranean climate. Italy is a member of the European Union and the currency is the Euro. Italy is also a Schengen country. Located 4Km south of the ancient city of Pescara, on the banks of the river Pescara. Located 9Km North West of the city of Bari, on the south east Adriatic coast. Located 4Km South West of the city of Bergamo, 55 Km North East of Milan in the Lombardy region, approximately 35Km from the Monza Formula 1 race circuit. Located 6Km North West of the historic city of Bologna. Located 2Km North of Brindisi, on the south east coast. Located 4 Km North West of Cagliari, Southern Sardinia, where there are particularly natural unspoilt beaches. Located 5Km north west of the historic city of Florence, 85km east of Pisa, in Tuscany. Located 8 Km West of Genoa, on the Mediterranean north west coast. Located 2Km South of Sant Eufemia Lamezia, on the south west coast. Located 5Km North East of Naples city, rich in history and culture, on the western coast. Located 3Km South East of Olbia, north east Sardinia, an area popular for its countless bays of white sand and luxurious developments. Located 32 Km West of Palermo, the capital of Sicily, on the attractive north west coast with its beaches, historic villages, nature parks and small islands. Located 10Km East of the historic city of Perugia, in the Umbria region, approximately 140km north of Rome. Located 1Km South East of Pisa, the city famous for its leaning tower, in the Region of Tuscany, on the north west coast. Located 5Km South East of Rimini, on the Adriatic east coast of Italy. Located 12Km South East of the centre of Rome, near the west coast of Italy. Located 32Km west of Rome, on the western coast of Italy. Located 3 Km west of Treviso, 20 Km north of Venice. Located 33 Km North West of Trieste, in the north east corner of the country. Located 7Km North of Venice (across the lagoon), with the Italian Dolomite mountains 100km to the north.